Hurray! This week, I am sharing the gorgeous work of Saje Photography from Cherry Hill New Jersey, and I LOVE the image she is sharing! 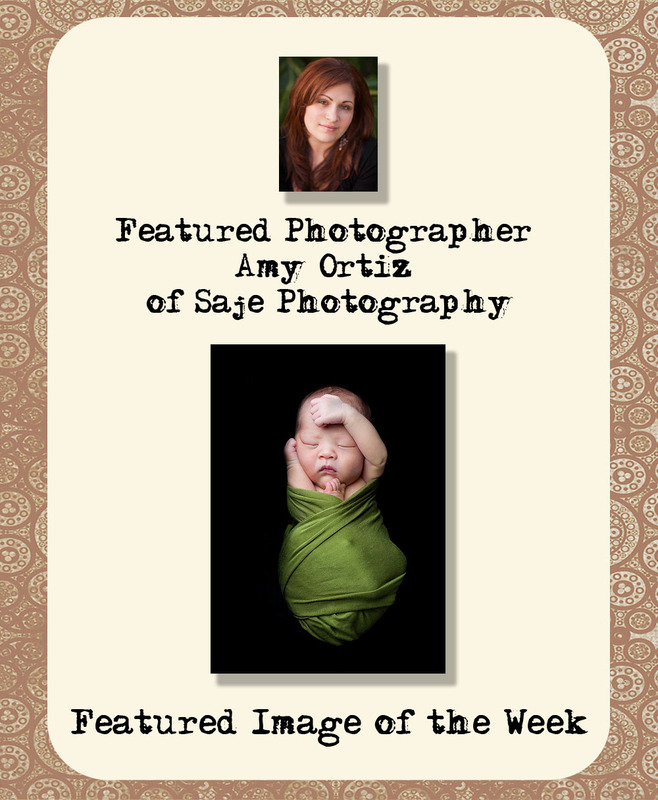 Amy Ortiz is the owner of Saje Photography, and she is just the sweetest, nicest person, and her work is gorgeous. You can see Amy Ortiz’s work right HERE. And tell me what’s not to love about the image she is sharing? I love those little toes. Gosh, just gorgeous! This reminds me of this little one still in mommies womb, a moment that will never be forgotten. Photography is a document of life. Something that is happening in life right before our eyes. And it’s my job to react to what’s happening to capture its essence. ART. Life I have to say I look at everything around me. It’s crazy even when I am in a car I will have the hubby slow down just so I can piece together what I would love to do on another session. Hum If I could just have 2 hrs every more to sip my coffee and read, I think I could handle anything the rest of the day. What is the one thing that you tell every client? This will be an experience you will never forget. Especially with Newborns I want them to remember this time forever. Stay tuned next week when I feature Gail Montgomery of Gail Montgomery Photography. You can go take a peek right here. Oh my goodness her feature image is adorable! Definately check out Amy’s work…it’s beautiful! I used to wrap my babies tight like this. Brings back memories. Absolutely love the vibrant color of the the cloth used to swaddle and that baby is so so adorable. Great share!